to my wardrobe which is made up primarily of neutral building blocks. 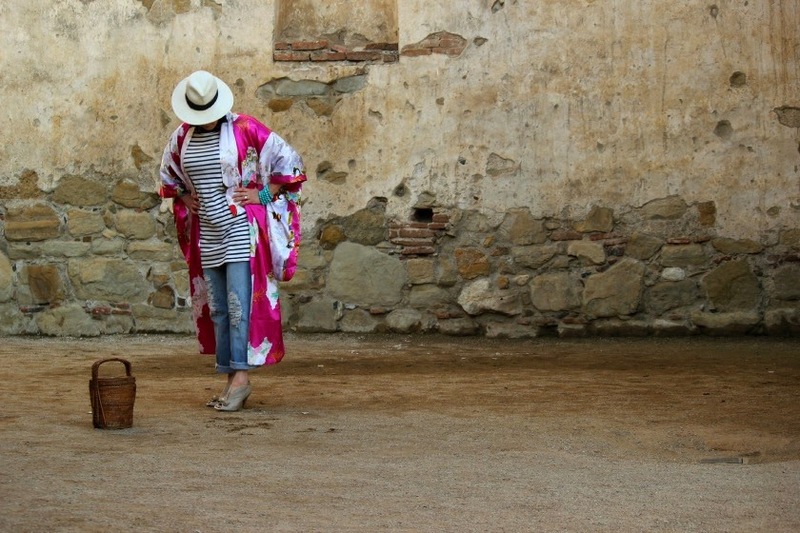 to style the kimono into an outfit incorporating some disparate trends I am enjoying. mixed with my normal pieces of sporty and glam. but I wanted to make sure it still was what I consider a good personal age choice. desperate to be younger than my newly 55. I actually found the perfect pair in my closet! made for the perfect purse. I always use nautical stripes as a neutral player. 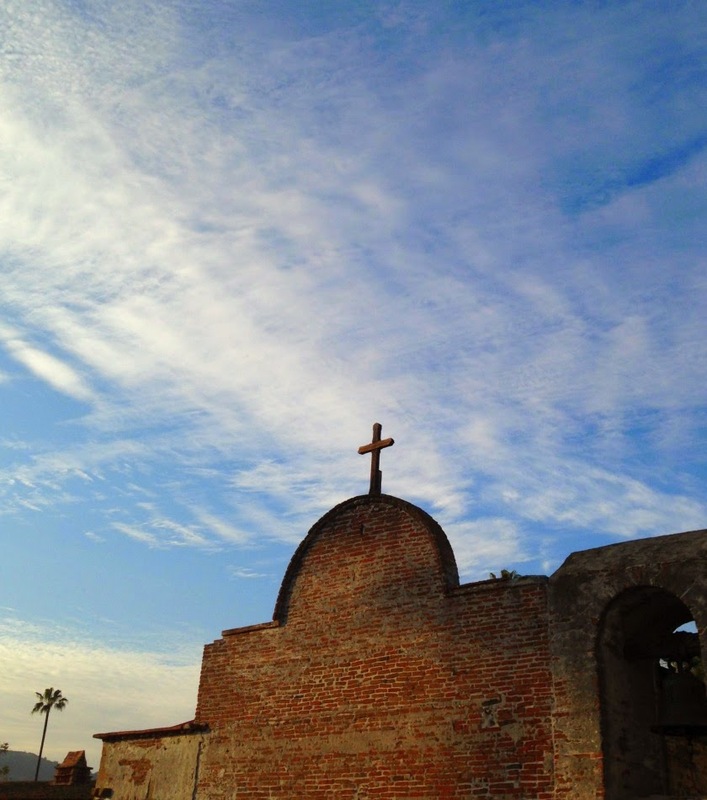 which I love as a part of my Southern California style. Of course I finished the outfit off with accessories. I have a DIY for the necklace here. So much beauty in this ensemble. 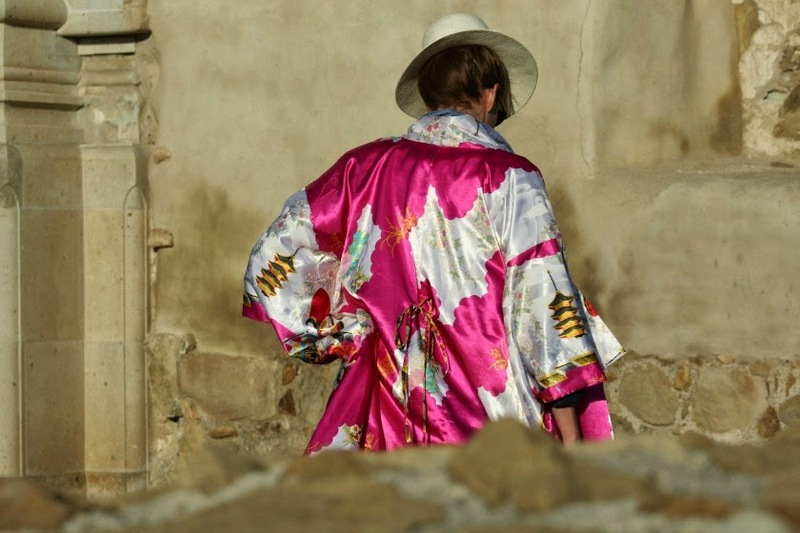 The kimono is outrageously gorgeous and love the juxtaposition. Your creativity is in full bloom! Judith my dear … your kind connecting words … are always such a gift to my heart! Stormy I am so happy to hear you found the Write the Blog You Want to Read inspiring … that is a gift to my soul! I am still working on my last installment to the series! I would gliding accept sharing champagne with you my dear! Good Grief……..Your photos are B E A U T I F U L! Who is the person snapping away at YOU? You have NO IDEA HOW MUCH YOU AND I HAVE IN COMMON!I have never met another person who has the ZEST for putting things together as we do!You look radiant and GREAT FOR YOUR AGE! My dear Contessa … my thoughts exactly when I saw your Paris photos of you in your Opera coat!! It is my wonderful husband on the other side of the camera now! I know I owe you an email my dear … hopefully today! Wow, so gorgeous and dramatic! And the kimono is pretty too. ;-) Seriously though, this seems to suit your style beautifully. My dear … you are the sweetest! Thank you for your very kind words! Ooooh, me's squeeking with delight here!!! I'm trying not to gush too much, but this is a favourite Tamera!!! Okay, I'm gonna use some caps....AWESOME, AMAZING, BEAUTIFUL...whew, glad I got that out! Such joie de vivre in these photos, the outfit sings! Thanks for sharing! Love the distressed jeans with the patching...cool concept! Another How to Write segment coming soon?, hopes me. Hey my colorful friend … I was actually thinking of you when I was shooting my kimono … you are always a true master of working colors so beautifully … so I am extra touched that you like it so!! Thank you for inquiring about the Write the Blog series … the next part is definitely in the works! I appreciate your interest! 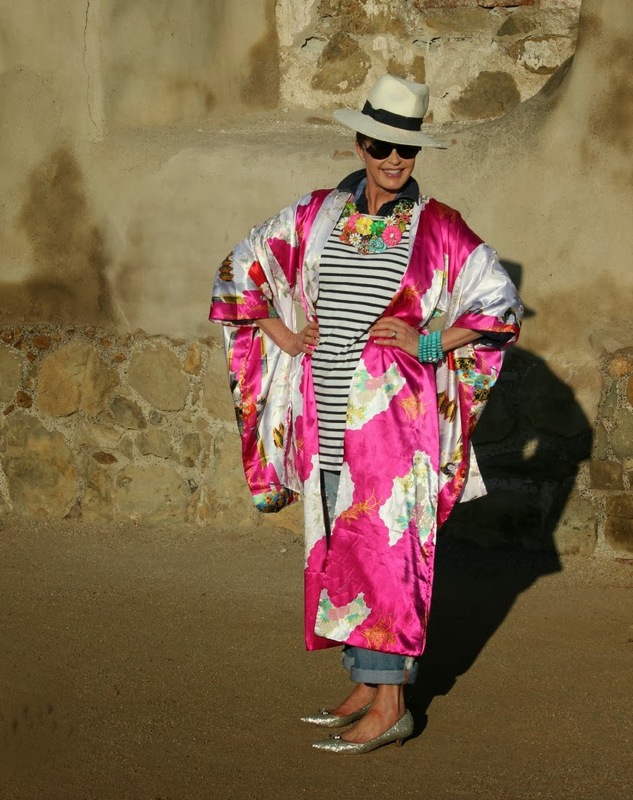 A spectacular kimono and stunning look. 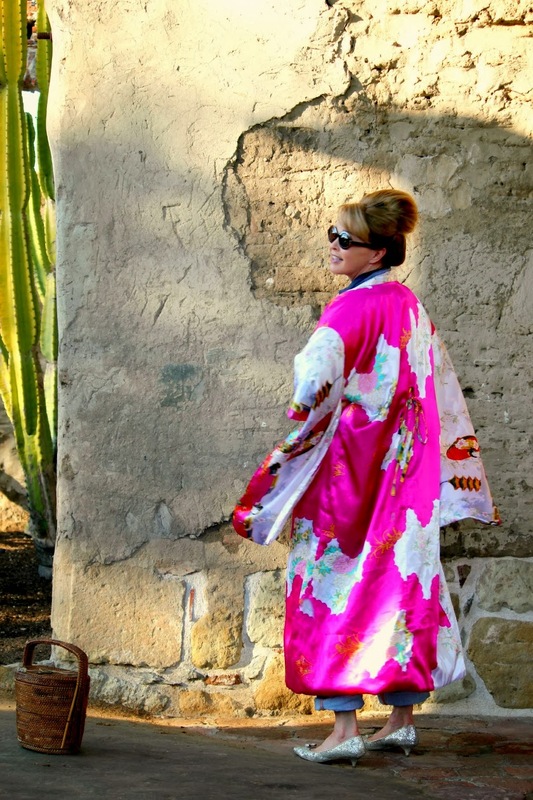 it is a gorgeous kimono and radiant as you are! Perfect fit! Compliments to your photographer! The last 2 of 3 photos of you are especially nice. I am smitten with this outfit. Ok, first off, you look like you were having the time of your life while taking these photo's. So who was making you so happy? I'm with you on mixing the distressed look with something more feminine. This ensemble is pricelss, something I would wear on any given day. I also love the fact that you shopped your heart out only to find the perfect pair right at home (been there done that). 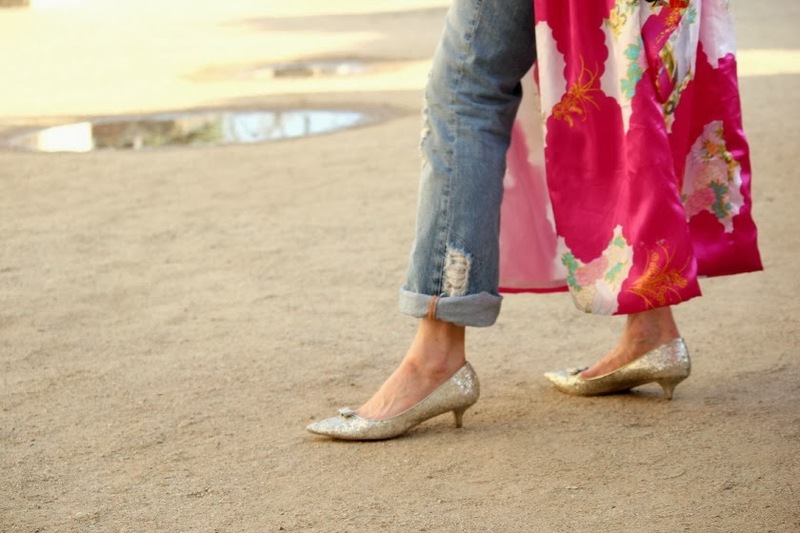 Lastly, the glamour kitten heels are the most versatile show I've seen in a long time. I sure hope your day was spent having as much fun as you made it out to be in your photos. You're just gorgeous. 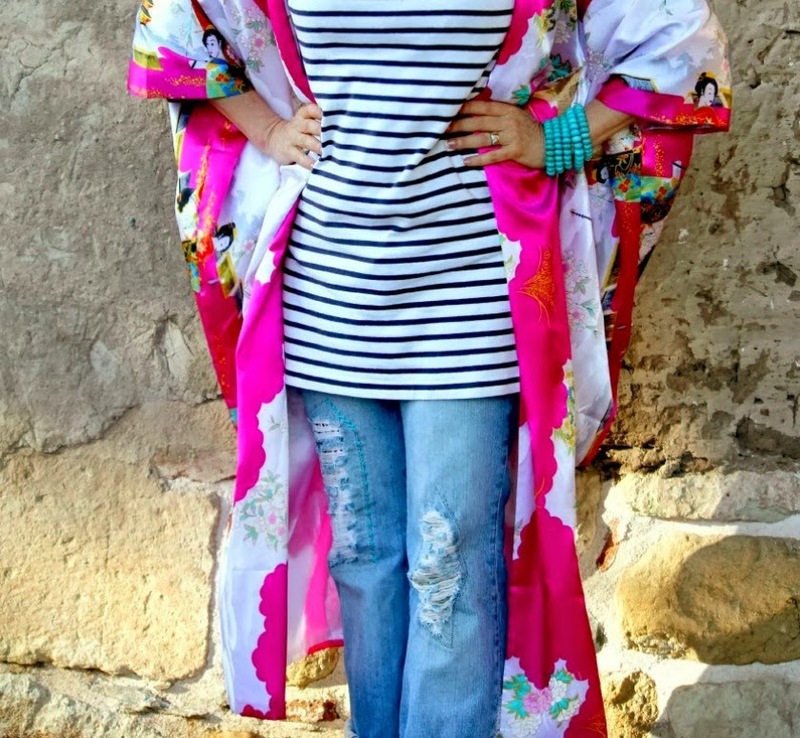 The kimono is a beautiful piece and you have styled it to perfection! 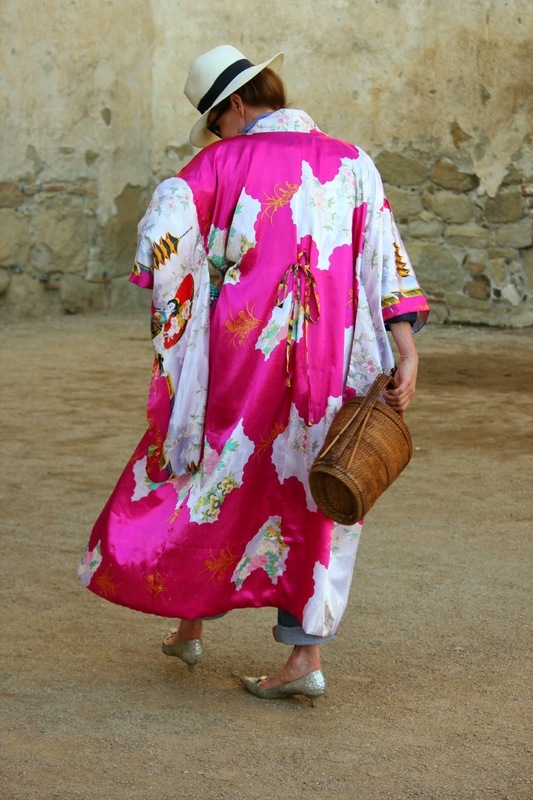 What a cool and beautiful kimono! Love the way you styled it and your photos are so interesting and pretty too! Gorgeous, gorgeous, gorgeous! Love everything about this. Well, of course. 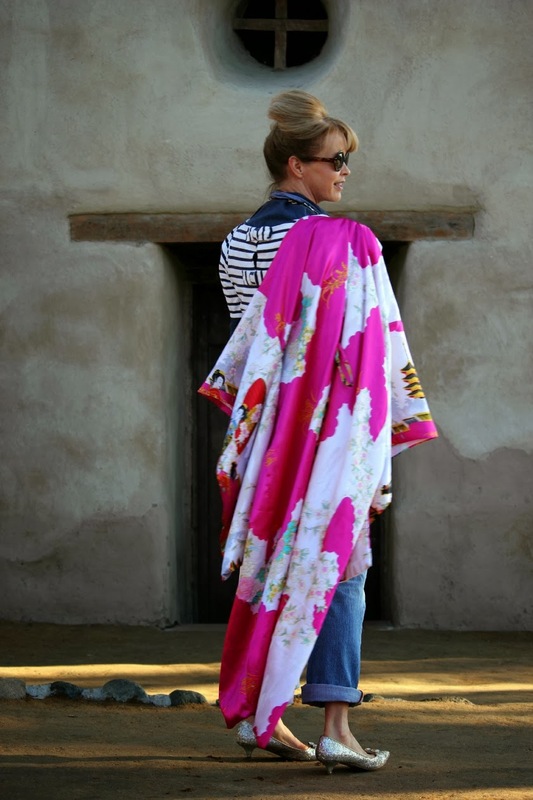 A radiant orchid kimono. Who doesn't have one of those? Seriously ... brilliant find, more brilliant styling! It's all great, but the hat and destroyed jeans make it all young and perfectly you!